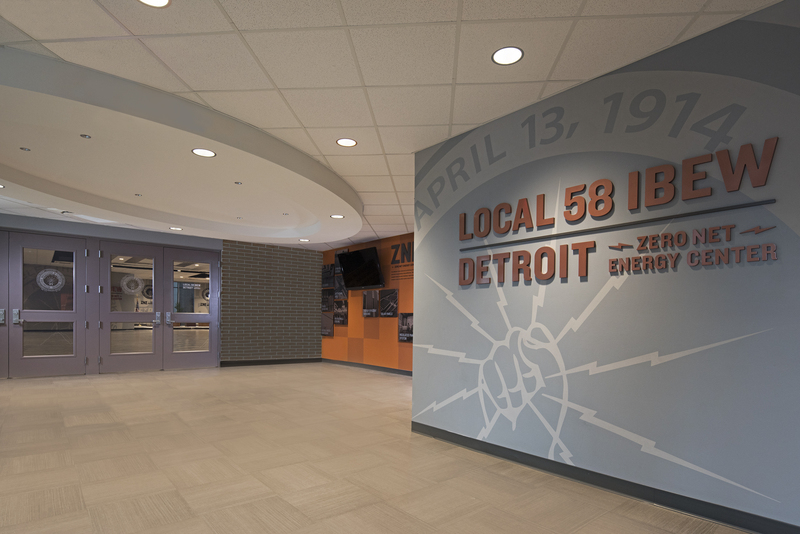 The Detroit IBEW Local 58 desired a new look and branded space that would empower workers and make it their own. To accomplish these goals, Ideation used a combination of environmental graphic design, custom signage and handpainted graphics. Ideation’s designer simplified the IBEW seal so that it would reproduce better and promote their brand identity. 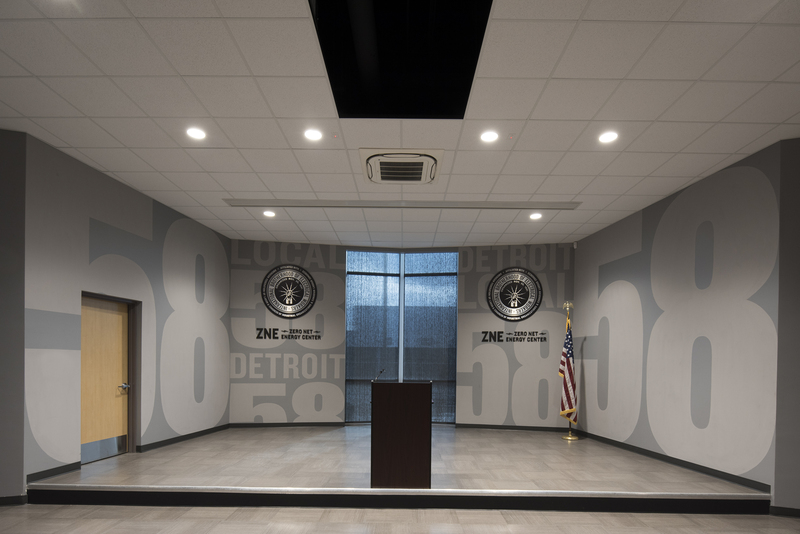 Michelle Lannoo, head designer of the Detroit IBEW Local 58 project, was able to give some insight into how the use of branded space helped IBEW tell their story. This experience audit is one of the most important aspects of any project. Having a clear vision of the end goal and the hurdles that may get in the way, make a project flow smoothly and stay on budget. Once everyone shares a common vision, then it’s time to roll up the sleeves and make it a reality. Telling a story with pictures starts with the canvas. 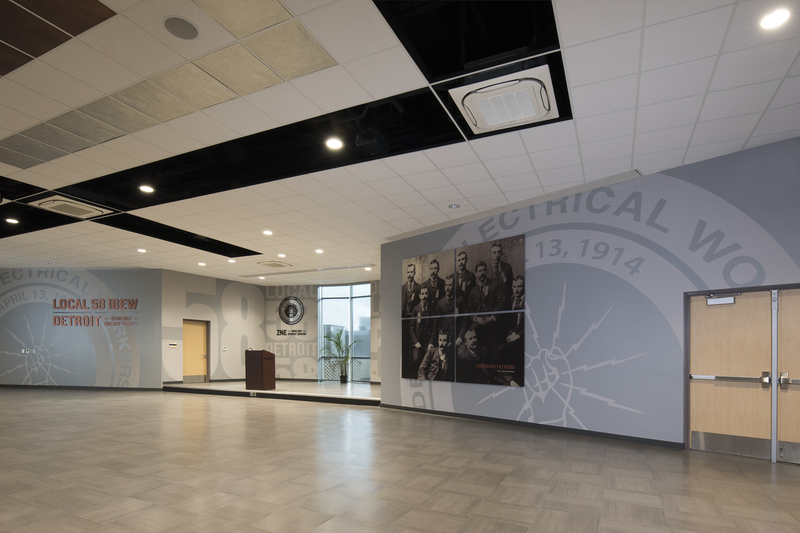 The IBEW building was newly renovated, with large open rooms, and blank walls. To reduce the feeling of ‘too much space,’ the architect had incorporated several interesting wall features. These unique features presented both challenges and opportunities for Ideation’s designer. The walls were painted a gray and the seal was handpainted on using a lighter gray. The two-tone colors were chosen to break up the starkness of the long walls. They subtle graphics drew the eye but do not take away from the more vivid colors of signs and graphics Ideation wanted to showcase. We wanted the design of the interior to connect with the exterior of the building. The copper color, appropriate for electrical workers, that was used outside needed to be brought inside. The best way to do this was to use copper coloring on the dimensional letters and walls. To take the metallic theme even further, Ideation’s designer knew she wanted to use steel signs on the walls. Since the images on the signs needed to tell the story of the organization, Michelle wanted to incorporate actual photos from the union members instead of stock photography. One of the challenges presented by the architecture was that the walls were not flat. Rather than downplay this element, Ideation sought to work with the architecture and emphasize the unique feature. To craft the signs, the quality of the pictures needed to be addressed. Many of the photos had been taken with worker’s phones. Ideation found that superimposing the images on metal signs compensated for any fuzziness or pixelation. The texture of the metal base worked well with the image quality and gave an old world feel to the pictures. Since they had already decided that metal signs would work well in the branded space. The second hurdle was how to hang the images so that they worked with the unique architecture of the walls. Michelle, the head designer, wanted to try wrapping the signs around the corners of the wall. Unfortunately, typical sign-making techniques did not work in this application. After trying several different methods, Ideation was able to come up with a prototype that worked. By putting the images on clear vinyl and then applying the vinyl to the steel panels underneath, they were able to bend the images around the corner of the wall without losing perspective or integrity. 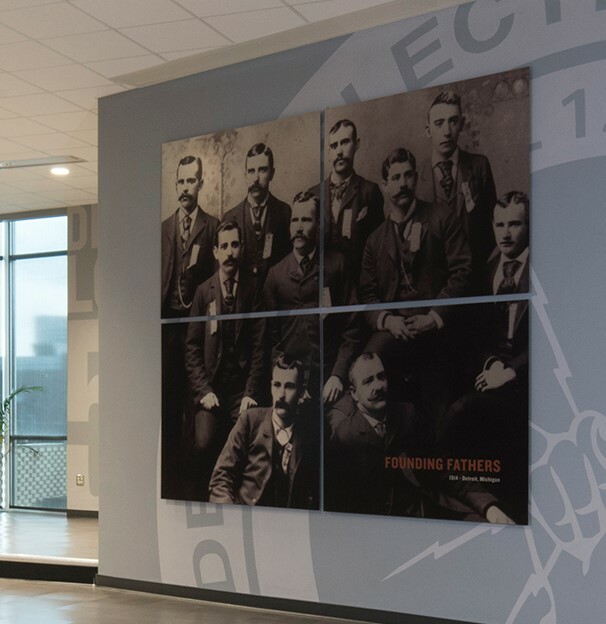 Using this process of putting images onto metal, it was possible to use an old photo of the Founding Fathers of the IBEW Local 58 to create a grouping of signs on the wall. The coloring and visual appeal of the photo also promoted the overall message of the branded space. Family, history, brotherhood, and a feeling of permanence would reach those that the IBEW hoped to recruit. 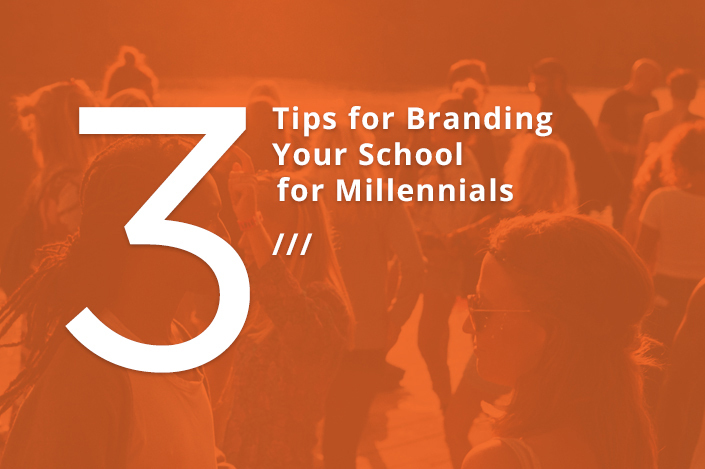 Not only did the IBEW want to share their story with those inside their building, but they wanted to communicate their brand to those outside. The IBEW Local 58 frequently holds news conferences. Because of this, an amazing opportunity to take their branded space and share it with a broader audience presented itself. The stage area where they film interviews and presentation was bland. The thought was ‘let’s incorporate the branding into the backdrop so it would represent the brand identity in every broadcast’. With that in mind, Ideation handpainted supersized graphics on the wall behind the podium. Dimensional letters, painted a metallic color, were placed to the side of the stage. The result was that there was always something of interest in the background showing from every camera angle. To complete the story, IBEW Local 58 also wanted to communicate the energy-efficiency of their building. Since many of those features, like insulation, stay hidden behind the walls and out of sight, we highlighted them for visitors on a story wall. A series of signs communicated the value of Zero Net Energy to the organization. Ideation placed these signs on the entry wall, so that, when a visitor enters the building, they can see that the building itself is a reflection of IBEW’s views on progress. 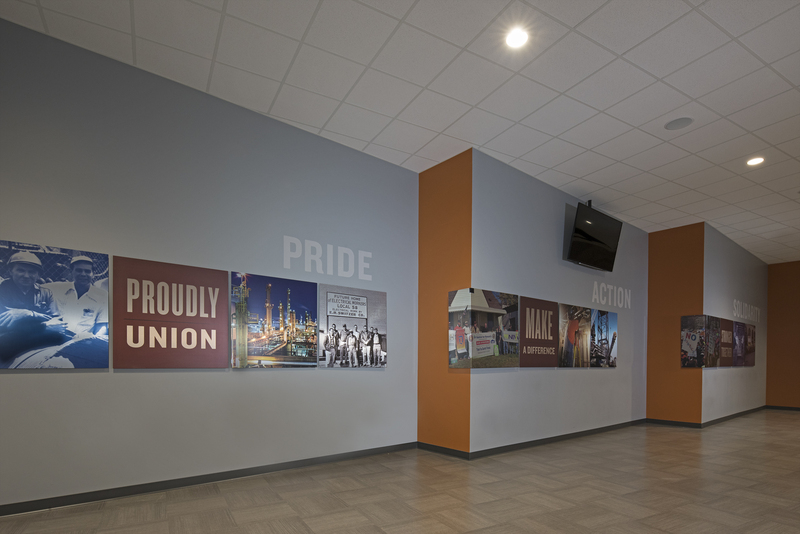 Upon the project’s completion, both the designer and the client felt that the branded space successfully communicated the IBEW Local 58 purpose, mission, and history to the members and visitors. Ideation leads the industry in creating branded space and brand identity using signs and environmental graphics. If you would like more information on how your space can better communicate your story, contact Ideation Signs & Communication in Royal Oak, Michigan.